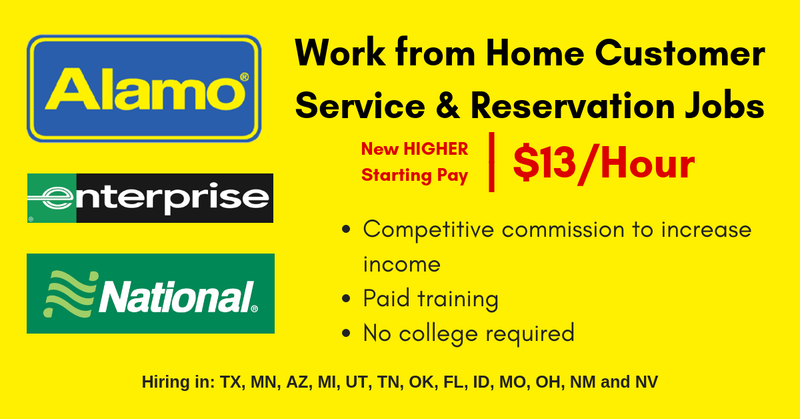 We offer a competitive commission structure on top of our hourly pay of $13.00/hour for employees who meet monthly sales goals. What can you expect? The average representative in this role earns $250/month commission pay, with our top performing agents earning $800+/month! Click here to learn more and to see if they’re hiring in your area. For more jobs like these, check our Newest Jobs & Gigs page. To be the first to hear about jobs like these, like our Facebook page and check your feed for our posts. May you be working from home soon! This entry was posted in Customer Service Jobs, Hiring Companies, Work at Home Jobs and tagged Alamo, Enterprise. Bookmark the permalink.